Related to a group called the "wagtails", American Pipits share their habit of wagging their tails when walking over open territory. They can be found throughout North America at some point during the year, nesting in the far north and high elevations in the west in summer, migrating throughout much of the continent in spring and fall, and wintering in in the southern U.S. and near the coasts. 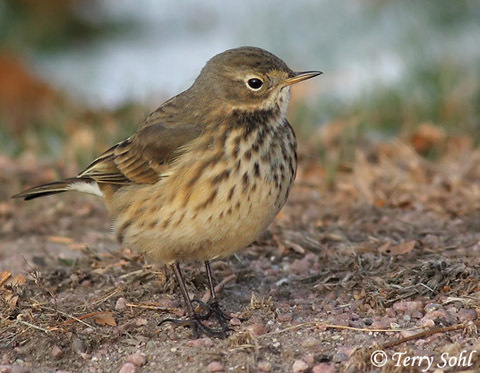 American Pipits are formerly known as the "Water Pipit". Habitat: Prefers open terrain during migration through the state, including mudflats, beaches, sandbars, and barren fields. Diet: Mostly insects. Will also eat seeds, especially those wintering inland. Behavior: Feeds by walking along the ground, looking for insects. They are normally found in flocks, except during the breeding season. Song: Rapid series in flight of chweee-chweee-chweee. 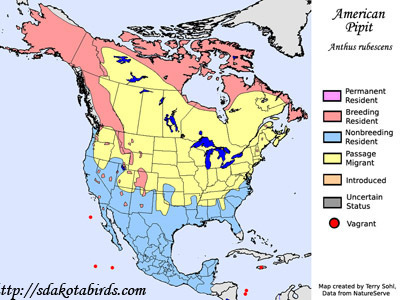 Migration: Summers in Northern Canada, British Columbia, Alaska, and high elevations in the Rocky Mountains. Winters in the southern U.S., along the coasts, and points south. Additional Photos: Click on the image chips or text links below for additional, higher-resolution American Pipit photos. South Dakota Status: Common to uncommon fall migrant, rare spring migrant. Fall migrants are most common in the northeast and north-central parts of the state.